Think you can run faster than Elvis? If it were the real Elvis Presley, who was known to have a penchant for peanut butter and banana sandwiches (often with bacon) and was a bit on the pudgy side when he died 35 years ago today, you probably could. 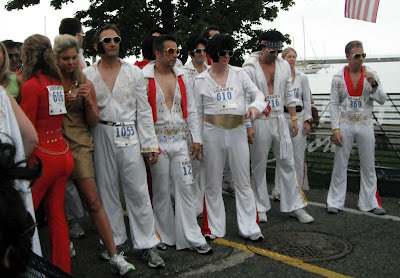 But if you had to challenge the Elvis impersonators at this year's Elvis is Alive 5K, then you could find yourself sprinting to the finish and gunning down those jumpsuit-wearing, microphone-toting runners. And lucky for them, it wasn't a sweltering evening for a fun run in polyester.